PUBLISHED: Buchanan & Hällgren – “Surviving a zombie apocalypse: Leadership configurations in extreme contexts” » Triple E.D. David Buchanan and Markus Hällgren have their leadership article based on the zombie classic “Day of the Dead” by George Romero published in pre-print. Available at the journal of “Management Learning”. If you´d like a copy drop any of the authors an email. 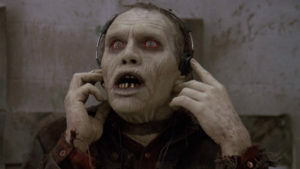 What can the classic zombie movie, Day of the Dead, tell us about leadership? In our analysis of this film, we explore leadership behaviours in an extreme context – a zombie apocalypse where survivors face persistent existential threat. Extreme context research presents methodological challenges, particularly with regard to fieldwork. The use of films as proxy case studies is one way in which to overcome these problems, and for researchers working in an interpretivist perspective, ‘social science fiction’ is increasingly used as a source of inspiration and ideas. The contribution of our analysis concerns highlighting the role of leadership configurations in extreme contexts, an approach not previously addressed in this field, but one that has greater explanatory power than current perspectives. In Day of the Dead, we observe several different configurations – patterns of leadership styles and behaviours – emerging, shifting and overlapping across the phases of the narrative, each with radically different consequences for the group of survivors. These observations suggest a speculative theory of leadership configurations and their implications in extreme contexts, for exploring further, with other methods. This entry was posted in Publications, Qualitative methods and tagged Extreme context, feature film, fictional narratives, leadership, process perspective, social science fiction, zombie apocalypse. Bookmark the permalink.